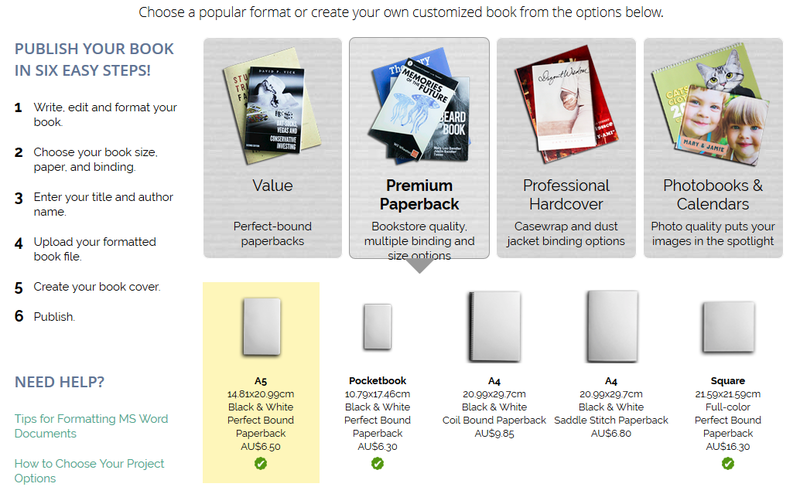 The Print On Demand option is very attractive for indie authors. We’re not rolling in dough. We haven’t got the patience or time to go running after a publisher or go chatting to distributors to please purchase these titles. We don’t care too much for storing boxes and boxes of our goods in the hope that, one day, we might offload them. Yes, there are many operators out there, including Amazon, who offer Print on Demand and distribution through the major channels. Why Lulu? I found it professional, easy to use and the pricing of everything is up-front and honest. 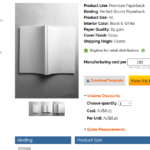 You can get an estimate on the cost by the number of pages, and, based on the size of the book, you can figure out finer details like the spine width and overall dimensions. That easy. 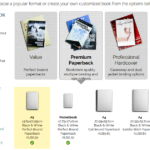 Select your book type, the size, put in the number of pages for a rough guide and you’re hot to trot! You don’t need to know the exact number of pages at this point, since this will be calculated when you upload the contents of the book. That’s later on. Bulk orders are interesting. You’ll notice that for one, the base price is $8.25 per book. At the time of writing, if one orders a bulk lot of 30, the cost per book goes down to $7.60, that’s nothing to sneeze at. And for a run of 1200, the cost is down to $6 per unit. One thing to note is that only a few formats can be used if you want to distribute through other channels like Amazon and B&N. They are the ones with the little green tick. A5 and square go through all channels but the Paranormology Series has been set up for the 10.79cm x 17.46cm (Pocketbook) which can be handled by Lulu and Amazon (feelsgoodman), but not by Barnes and Noble (sadpanda). This is a real shame, because the Pocketbook size is really convenient for novellas. The other another important note is that the form factor is note the same between sizes. If you’ve got your front cover for your ebook in a particular dimension, you may need to go back and redesign / crop / bend / twist to get it to fit to the book’s dimensions. Do you see that little button on the second panel that says, “Download Template”? That’s your friend. We’ll look at that in the next post along with uploading the content, ISBNs , and pricing.